Many testers noted that the Mizuno Wave Inspire 13 adhered to their preference in terms of the size schemes. A runner reported that it felt great and it performed well on the roads. ‘Comfortable’ was used by many consumers as a means to describe their time wearing this shoe. Several reviewers stated that this version was suitably more cushioned than the previous ones. The cushioning system was responsive and agreeable, according to several commenters. A runner wrote that the toe box was roomy enough to allow natural toe-splaying. According to a purchaser, the Mizuno Wave Inspire 13 felt lighter than the previous stability shoes they’ve used. Runners generally didn’t have concerns when it came to the durability of this running shoe. This version was touted by its users as a great evolution to the long-running series. The fit was a little loose in the middle section of the shoe, commented a tester. A runner didn’t like the laces much because they wrote that it easily came loose and that it gave the impression that it could easily break. According to a purchaser, the cushioning near the heel area wasn’t very efficient because it felt as though the rear of the foot was falling through the bottom. The midsole felt hard and inflexible, complained a consumer; it apparently diminished the potential for natural movement during the running session, as well as causing some foot discomfort. The Wave Inspire 13 from Mizuno worked well for a great number of runners, especially those who desired reliable stability and performance. They noted that its components were dependable and efficient, making it a solid choice for the roads. On the other hand, there were those who had some concerns with its general construction and quality. Will the Mizuno Wave Inspire 13 inspire your running? stability shoes designed to let you run miles in comfort without giving your joints too much of a hammering. What this means is that they are fairly substantial in terms of cushioning with a big, wide sole giving you lots of ground contact. I usually run in more lightweight racing shoes so these are a bit of a change and I wasn’t quite sure what to expect. I really like the design and style of these shoes, especially in the silver and orange colorway. They definitely look better in the flesh than in pictures. The design itself is fairly traditional with everything in proportion and just enough flashes and stripes without going over the top. A bit too bright to wear as anything but a running shoe. Still, I really like its orange and silver color pairing. When I took these out of the box I was a bit worried that they might feel like I was wearing a big, heavy pair of slippers. But they actually feel surprisingly light and are not too soft and wallowy. That does not mean you will feel much of the ground beneath you if that is important to you but they did not feel slow which was a pleasant surprise. The sole is not particularly flexible but is definitely a comfortable place to be in for longer runs. The padding around the collar and on the tongue is just right giving plenty of plush support without ever rubbing. They did a feel bit warm at times so they are more of an autumn to spring shoe rather than summer but this was not a big problem. The width was just right for me. To put this into context I find precision fit Inov-8 shoes bordering on the tight but have not found any other shoes tight at all so I probably have fairly narrow feet. Sizing was also true, I am a UK 10.5 in all my other shoes and this size was fine for me here. The toe box is plenty big enough and the uppers are soft and flexible, meaning the Wave Inspires score highly on comfort for me. You get a big, wide sole that works fine on the road in all but the wettest conditions. I have mainly stuck to the road but the Wave Inspires coped fine with a bit dry, summer trail runs. There is plenty of support provided by the sole plate across the middle and lots of cushioning from the midsole. The 12mm drop also helped with the supportive feel though the sheer size of the sole did make me feel like I was plodding compared to smaller shoes but I could soon get used to this. The Wave Inspires are made for logging long miles in comfort and they certainly fit that brief. They are not meant to be a fast shoe and I would not wear them for a 5k or 10k race as I think they would slow me down a bit. On the plus side the lacing works well in providing a secure, lasting fit and my legs felt well cushioned over longer runs. The Wave Inspire 13 are a good looking, comfortable and supportive pair of running shoes. They are pretty solid and do not exactly put a spring in your step but on long, steady runs they have given me no issues at all. They are a bit inflexible for my liking but I have only done about thirty miles in them so far so this may improve with time. 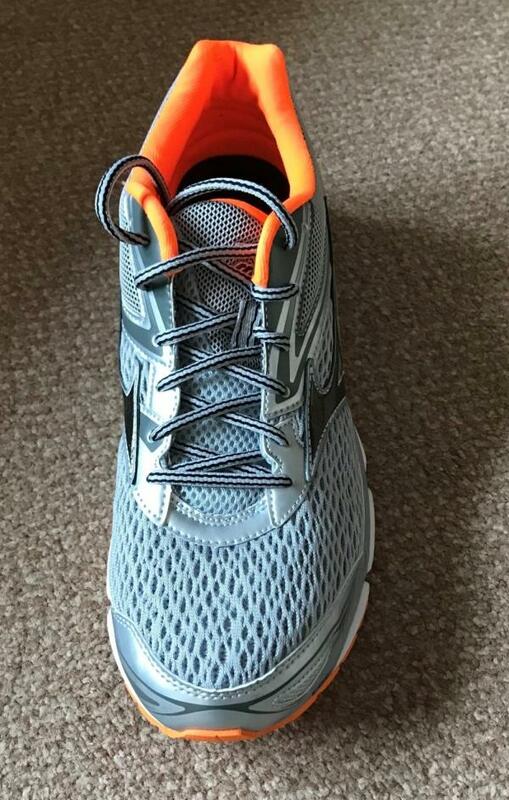 If you are looking for something stable and supportive for long, gentle runs these could be for you especially in the silver/orange which I am a big fan of. Thank you to the generous people at Mizuno who sent me the Wave Inspires to test. It's still a firm stability shoe that really helped my knees. I didn't get [any] knee pain. What the Inspire lacks in responsiveness, it makes up with stability and ground feel. The wide-flared forefoot creates an extremely supportive base, and the Wave infused rearfoot prevents sideways lean. The Mizuno Wave Inspire 13 comes with an updated upper. It utilizes a new upper mesh design that offers improved flexibility and breathability. The almost seamless upper design provides enhanced comfort and improved overall on-foot experience. The shoe also comes with an updated midsole. Aside from the new u4ic midsole compound, the Wave Inspire 13 comes with a new u4icx heel wedge for a smoother underfoot feel. The Wave Inspire 13 has a standard running shoe length and the fit much the same with its predecessor. It has a medium fit from the heel to the forefoot area and has adequate space in the toe box. The widths for men’s and women’s versions are standard D and B, respectively. The outsole unit of the shoe utilizes the Mizuno X10 technology and blown rubber compound. It provides reliable traction while running on the road and this is also used in the Inspire 15 running shoes. The blown rubber in the forefoot provides durability and added cushioning. It also features the Flex Controllers that is strategically placed in high-flex areas for enhanced flexibility without adding weight. The Mizuno Wave Inspire 13 still utilizes the brand’s Wave Technology that provides enhanced cushioning for a more responsive ride. The gender-specific grooves are also designed for a smoother heel-to-toe transition. The shoe still uses the double fan wave that is designed to reduce pronation and for a more stable ride. It also uses the notable U4iC midsole technology that provides maximum shock absorption for a tough ride and added durability. The 13th version of the shoe features the new U4icX Heel Wedge that provides a softer underfoot cushioning and it is much lighter than the U4iC version. The Mizuno Wave Inspire 13 features the AIRmesh upper coverage that provides breathability and enhanced flexibility. This works perfectly with the Dynamotion fit that offers a comfortable forefoot fit and the collar construction provides added comfort. Lastly, the stitched overlays in the lateral and medial side provides a secure foot lockdown.